Does it help to be the last job candidate interviewed? Home » Does it help to be the last job candidate interviewed? In the March 20, 2018 Ask The Headhunter Newsletter, a reader worries about being the first or last job candidate interviewed. One of the last questions I ask during job interviews is where they are in their hiring process. I have read that one should try to be the last applicant interviewed in the process. But in the majority of my interviews, I have been the first candidate, therefore setting the bar. How does HR schedule the candidates with the hiring managers? What is your take on how the interview order affects who gets a job offer? There’s not a rule of thumb about this, but there are some interesting phenomena in the study of cognition and memory that might influence the order of choice. Are you the most recent job candidate? In memory research, there’s the primacy effect and the recency effect. The research suggests that we’re more likely to recall the first or last stimulus in a series (for example, a list of foods we’re supposed to remember) than we are to recall those in the middle. So, maybe it’s best to be the first or the last job candidate, but not one in between — because the interviewer is more likely to remember you more clearly. Does this serial position effect influence who gets hired? I think sometimes it does — but it’s certainly not the most important factor. In my own experience, I’ve interviewed so many candidates that they all seem to blur together because none stand out. But there’s the point: The candidate who stands out for some particular reason will stand out no matter where in the order they appeared. It’s not hard to see why a very good or very weak first candidate sets such a high or low bar that they stand out in the manager’s mind! I’ve sent candidates on interviews who were first, and they also wound up being the last to interview. That is, they were the only candidate. The manager cancelled subsequent interviews because my candidate was good enough to be hired. I’m not suggesting I send in the perfect candidates. Sometimes good managers are just relieved to have a really good candidate. They make the hire and they get on with it. They just end the process at that point. That’s a manager who is being practical, and more power to him or her! Of course, sometimes my job candidate is first and gets the offer, but only after we have to wait quite a while for other interviews to wrap up. 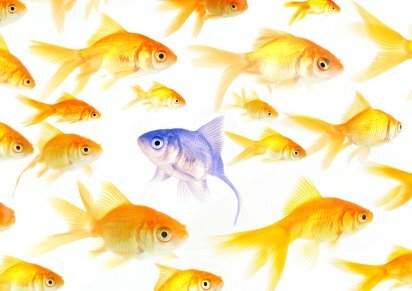 Which job candidate stands out? To learn more about what really makes you memorable to a hiring manager, see Stand Out: How to be the profitable hire. Now that we’ve discussed what we might call the mind games of psychology, let’s get real. Your goal should be to stand out! That is, to blow away all your competition in your interview – not to manage the sequence. What matters most is what you demonstrate in that interview. That’s what counts. Be the candidate who hands-down demonstrates how they would do the job profitably for the manager. Be the job candidate the manager remembers because of what you said and what you did in the interview — not because of when you showed up. An employer that is determined to interview X number of applicants often wastes a lot of time. That employer is very likely to lose its first choices to competitors because the best candidates aren’t likely to wait around for a lengthy decision process. Many companies interview gratuitously. That tells you a lot about the quality of management. They’re so fixated on having lots of choices that they forget the objective is to hire someone who can do the job well! And that might be the first candidate. Your goal should be to blow away all your competition in your interview – not to manage the sequence. For more tips, please read Why am I not getting hired? Would you rather be the first or the last applicant interviewed? What has your experience been regarding where in the sequence of candidates you were interviewed? Does it make a difference? If you’re an employer, do you insist on interviewing more applicants even if the first one can do the job well? This job offer is unreal! A sure way to be memorable as a candidate is the NEVER send an email follow-up/thank you after your interview. Always, ALWAYS, send a hand-written card to each interviewer, separately. I recently switched jobs and both companies who interviewed me made a clear effort to reach back out to me and thank me for sending a hand-written card. Their main point? “No one ever sends those, and none of the other candidates sent one [we only got an email from them]”. I then got an offer from *my* first choice out of the two companies and was blessed to tell the other employer ‘toodles’ (in a professional way). If you feel you brought your A-game to the interview, cement that impact with a formal, hand-written card. I always go to an interview with cards and envelopes pre-addressed and stamped for each person interviewing me (plus extra just in case a change in people happened last minute). On my way back home I’d write my comments/praises using talking points I had with EACH person, then dropped the cards off at the post office near their office for next-day delivery (so, there’s no need to worry about them forgetting you during the snail mail movement). This is a simple, elementary action ANY applicant for ANY job can do. Trust me, the feedback I receive each time is telling on how memorable that made me to each company. I stood tall…in absentia! My employer said that my hand-written thank-you notes were another point in favor of eventually hiring me, because I was the only candidate that did this. They knew that the job has a lot of client-facing time; the notes showed an attention to detail and appreciation for the time spent. I generally send both. That way they get the immediate, but then a day or so later another reminder. David, do find that you get good results sending both? When I asked my employment counsellor about sending both email and hand-written note, she said NO, only email or note – not both. I’m employed. My current position is with a “high tech” company so I didn’t do both. I suppose it varies. Company to company, and so on. I was with a high tech company also, and judging from the mail room most people looked at their snail mail once a month if then. And their mail slots were not exactly overflowing. So someone sending a paper thank you note only might find it still sitting in a mail slot when they start the job. I always written thank you notes. I had one prospective employer comment that what I did was “quaint” (I didn’t get an offer), another comment that he had never received a written thank you note from an applicant before and asked why I would do that (only gave him more junk mail to go through), but most never say anything. I still do it, because I think it is basic courtesy. Whether it has actually made a difference for me, I think it is a crapshoot. It depends upon the employer. If you get someone who is annoyed by it, then it won’t help. I also think there is such a lack of basic social skills that even employers can be clueless. I agree with everything Nick says here, as usual, but one time I did experience a disadvantage when interviewing early in the process. Call it the Corcodilos Effect. More validation that the Ask the Headhunter approach to job interviews really works. But interviewing late in the process would have worked out better for me at that particular company. Ah, the old “steal the best candidate’s ideas” and then don’t hire them… I wonder if that employer really hired the best person, if it had to feed other candidates the proper way to approach that job! I’d have hired you because you likely would have brought that same savvy approach to the job every day! Put your efforts into telling the hiring manager about how you can bring profit to the organization (value, if its a non-profit) and stop worrying about birth order, fonts on your resume, and interview order. You will be happier and employed faster. I was the first person interviewed for my current position. My manager and the other person who interviewed me had already made up their minds that I was the one they wanted. My boss says I have worked out better than he expected. They did interview two more people after me, but that was pro forma. Another time I was the first person interviewed because I was the first person who responded and they really liked me from the get go. The job went to a local person who had a higher degree (interesting how highly qualified people come out of the woodwork at most opportune times). I have often found that as the last person interviewed that minds are already made up so I might as well have not shown up. In one interview, the hiring manager acted like a jerk and did everything to make me look stupid. I withdrew my name from that position. I’ve heard this referred to as “the curse of being first”. Either you’re lost in the fog of the other candidates that follow or an interviewer may feel silly about hiring the first person they see (as if someone is going to shout “what are you, a toddler!??”). If this a real factor for the job seeker, you either didn’t make much of an impression or are interviewing for people who care too much about a mundane detail like interview order. YES. I always try to be one of the last person interviewed because of this curse. I say this mostly because these days, hiring managers are so busy and overworked as it is, that they are just running on fumes and going through the motions until the right candidate comes along and just wows them. Or that they just get tied of interviewing and “close enough” will do. Win by default! Being last or close enough to last is especially important with panel interviews that take place at one time or in segments at the same time. By taking “The New kid in town” approach, you can ask questions like “how the job became available,” “what has been your impressions of the people you talked with so far,” company culture, etc, where you very CLEVERLY do the job in the interview. Cliches aside, that’s when you strike when you’re hot and go for the gold and ask about pain points and how, based on both life and work experience, you can be the person that can turn things around. If you throw in “I’ll make you look good” in there for good measure as well, you can petty much guarantee a second interview or maybe even a job offer. Experience is the best teacher. On 3 occasions I was the last since they made me offers before I left the building. The question is why? Like the others being interviewed (engineer in manufacturing, grew into management) for Director & VP positions. The reason I stood out was partially luck, mostly a lack of self control. I wasn’t a lamb during the walk thru (being shown the operations). They said blah, blah, blah, and they expected I would say baa, baa, baa. On these 3 occasions, I was so shocked by what the people were doing that I stopped the walk thru, and on one occasion actually put my hand on the hand of the person on the line to stop them (I apologized, it was a reaction). They put the product, and themselves at risk of harm (my Luck?). I saw the potential for physical danger from a total lack of understanding their problems. I described solutions. As I said, Luck. I stood out, and while I wasn’t trying to stand out that way. I understood their problems, and offered THE solution on the spot. I was what they needed vs what they wanted. If you get in the door fully prepared for the standard, generic questions you think you are are invincible. Forget your resume, BE COGNIZANT of their NEEDS. Apply your knowledge in real time to solve THEIR problem. Being first, middle, or last is irrelevant if you control the height of the bar. @Joseph – This was an excellent example of “doing the job” at the interview. You say it’s luck. I suspect that luck had little to do with it. You had the experience and knowledge to recognize the issues, and you did the job by stepping in at the right time. How many people went through the same tour, saw the same basic process, but didn’t respond the way you did? I’m with Stephen. I don’t see what luck has to do with it. It seems to be your acumen and outspokenness. After I started one of these positions, I found out a friend also had interviewed just a day before. While he recognized that the stock room was disorganized, and rejected material was sitting on new material. He didn’t question the CEO about it. I did. The realization that they could be using rejected materials for new product along with a couple of other suggestions for improvement, sealed the offer that evening. My friend realized that he missed an opportunity, but he still paid for lunch. He ended up at another equally good position soon after. I wish I could network with the people who did get the position I wanted just to see what set us apart. Even through LinkedIn connections, I have never been able to get together with the person who did get the job offer. In your first paragraph you seemed to indicate that you got the job offer. However, in your last paragraph it seems you didn’t. I don’t quite understand what happened. Did you almost get the job or? Borne – Sorry for the confusion. I was trying to keep the response short. I was the only one called back for a second interview, and I aced it. Then they made me the offer before I went home. Actually I didn’t accept, and I negotiated a move package over 2 days before I accepted the offer. In all 3 occasions I was told I had it at the end of the first day, but details like additional vacation, upfront bonus, annual bonus, and moving packages delayed all of the final offer letters several days / week. By the way, I agree with your take on HR departments. At one point I remember discussions about why Personnel Departments were really Human Resources. It made sense if the new HR department actually took their “human resources” and developed them through meetings, lectures, outside courses, advanced degrees etc. into a better employee for the company. They would use employees feedback desire for growth along with managements plan to develop their employees. An idea that was a Win – Win for everyone. But that started to degrade through the 80’s into what we have today. I believe that that concept is now extinct. Actually, nowadays it is often not a simple case of being interviewed first or last, as often there are multiple rounds of interviews nowadays. This makes the whole process more complicated. I have been thinking about how personnel evolved into the modern day ‘human resources’. I’m not sure exactly when the name and function change started, but they are different and this impacts job applicants. Personnel departments seemed to value staff more, whereas nowadays people are regarded by the ‘human resources person/department’ as simply a ‘resource’, like a machine. The difference between “Personnel Dept” & “Human Resources” is that Personnel was more transaction-based & administrative, while Human Resources is supposed to be more strategic & work as a business partner with management to help achieve the organization’s short & long term objectives. Rather than just “pushing paper,” Human Resources has become a profession in its own right, with required professional certifications (for example: PHR, SHRM-CP, CCP, CEBS, etc.). HR staff have also become very specialized: for example: Recruiting/Talent Acquisition, Benefits (Health & Welfare or Retirement), Compensation (Base Pay Admin, Variable/Incentive Pay, Executive Compensation), Training & Development, Employee & Labor Relations, etc. Dr. Lee Meadows of Walsh College in Michigan has written extensively on this subject. Many repetitive processes have been automated to free up HR to be a better partner to management. With automation & advances in technology (like Applicant Tracking Systems), has come some regrettable depersonalization & some processes have lost their personal touch. Good Human Resources Departments are developing “best processes” to improve their recruitment process. @Elena: I think you are correct about your description of HR and how it has changed. But I think the HR function is best in transactional mode. The notion that companies want or expect HR to be strategic is, in most though not all cases, little more than fantasy. HR just is not given the real power to do that, nor is it treated that way in the C-suite. Worse, the newly-certificated HR profession has proved generally incapable of taking the bull by the horns and exercising any power it may have to do anything strategic. One ATH regular has put it well: HR functions best when limited to payroll and benefits processing. It’s been 20 years since the advent of automated recruiting in HR — and I still don’t see any better, much less “best,” practices. If HR is going to claim the role of “human resources management,” it hasn’t done a very good job. I’ll go so far as to suggest HR has set back the strategic management of humans at work a decade or two. I think the question is no longer how much HR should be doing, but whether HR even needs to exist as it’s currently configured. Having said all that, I know some HR folks who do a yeoman’s job of delivering on what they promise. They’re few and far between, and they have to claw for every inch they gain for their companies. Borne: very well-outlined, the transition from an intuitive people based Personnel operation to the arid HR bureaucratic machines that has eschewed people skills to emulate a machine yet without the competence or efficiency of a proper automated system. It’s no exaggeration to say that some HR staff are examples of Artificial Human Unintelligence. I can only opine from a British perspective but I believe it is high time that HR and recruitment was properly regulated, in the same way that a business has to comply with Health and Safety laws, so do should exist a parallel framework for recruitment: eg no advertising of false jobs permitted, all candidates should be responded etc. I read a study by an executive search firm that showed the first candidate interviewed had a 20% chance of being hired and the last candidate had a whopping 60% chance of being hired. The candidates in between had lower chances of being hired. In the past I’ve often been the first or 2nd candidate interviewed & often ran into an issue with employers saying to the recruiter, “she’s wonderful but we need to see more candidates before we make a decision.” Of course, by the time they had interviewed 5 to 10 more candidates, they couldn’t remember my name. Between the primacy & the recency effect, I believe the recency effect is much stronger. When I’m last (or 2nd to last), I almost always get the offer. I know it’s not always possible to affect interview order, but I try to aim for something near the end of the week. I find that has a huge effect on my chances of getting an offer. After the last interview, I got the offer ON THE WAY HOME. BINGO. ELENA WINS THE PRIZE. DING-DING-DING! Despite what you read in the news, companies and NPOs are in NO HURRY to hire. They can just work their existing staff to death (or get a low-paid intern or “volunteer”), until they find “The One.” And if they don’t? The job req likely gets pulled and they try again in 6 months or so. You learn something new every day. I’m adding “primacy and recency effect” to my vocabulary. @Elena: Can you share the study you refer to? I’d love to see the details. Thanks!